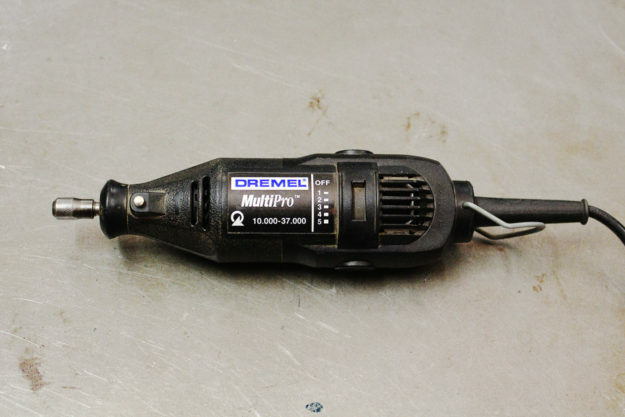 This week, I want to talk about one of the most indispensable tools in my shop: the Dremel rotary tool. I love Dremels. I don’t get paid to write that—I buy all my own Dremel tools, and whether it’s the Dremel brand or not probably doesn’t matter. This rotary tool is simply a high-speed motor with a small chuck at the end to grip the shanks of accessories. The combination of high-speed and specific accessories to cut, grind, sand, carve, brush and polish (have I missed any?) makes the multi tool incredibly useful for motorcycle work. As with any rotary tool, the general concept is simple: a harder material can be used to cut (or grind) a softer material. 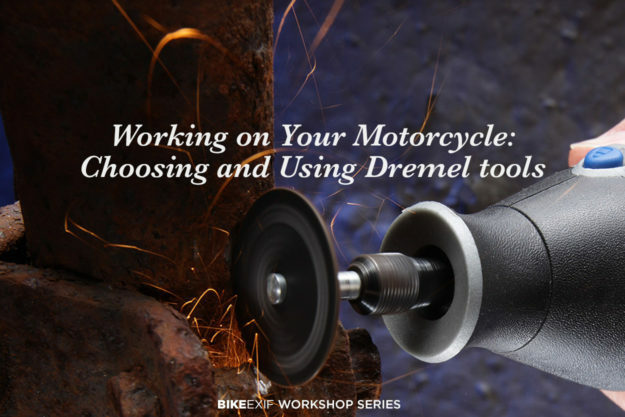 What Dremel tool is right for you? I rate the MultiPro, and have owned three in around 15 years. The earlier two eventually quit working, but they lasted me a long time, and, honestly, they were probably abused. I keep buying the Dremel brand, because I know they will take a beating. I haven’t used a battery-powered Dremel: I use it in my shop, so I stick with a mains-powered version. This particular model has a variable speed motor, with a spindle and a small chuck at the end. Frankly, I have never run my Dremel at anything less than full speed, so a single speed model would probably be adequate. Dremel’s website does however advise slower speeds for cutting and grinding metals, and slower again for plastics. Most cutting or grinding tools work best at a particular speed range (measured in meters per minute, or some similar velocity measurement). At the tiny scale of Dremel accessories, the tool needs to be spinning very fast to achieve the optimum cutting velocity. 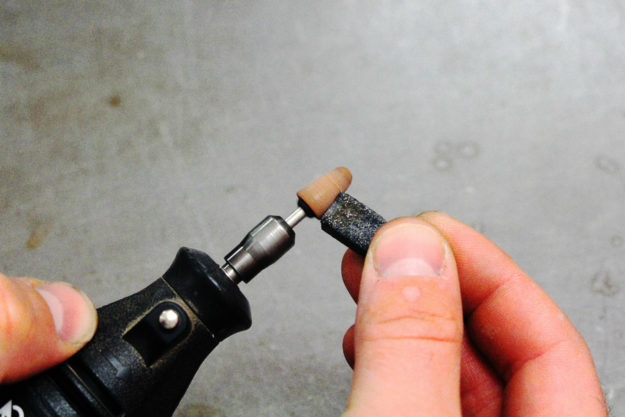 When you screw the collet nut down it squeezes the collet, which grips the tool shank. Different size collets are available. This allows you to use tools with various shank sizes. 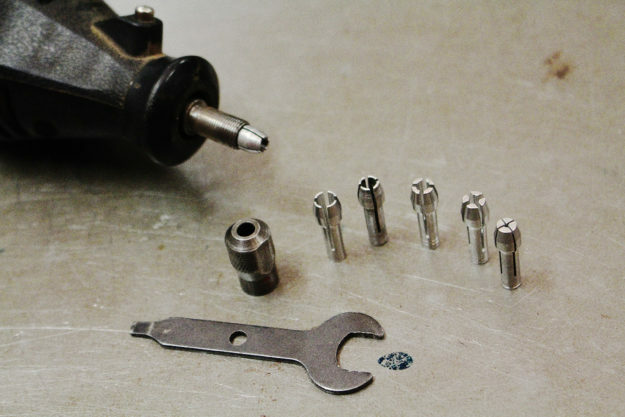 My version of the tool has a shaft lock (the silver button on the side of the black body), and an included wrench that tightens the collet nut. Most of the accessories are nominally 1/8” diameter, however I have a smaller collet and some accessories in 3/32 ” diameter. If you screw down the collet nut and the cutting bit shank is loose, then you need a smaller collet. You can buy the smaller collets separately. 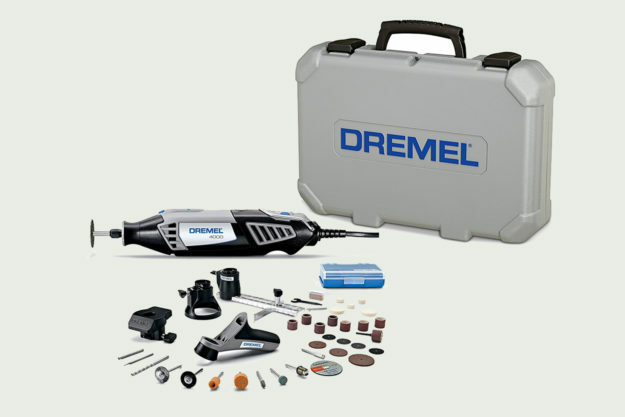 Accessories The benefit of a Dremel rotary tool is similar to an angle grinder—there are dozens of accessories to extend its use. I would suggest it is far cheaper to buy a kit with an assortment of accessories than purchase them individually. Here are some of the accessories I use. Cut-off wheels The cutting wheels are almost always the reason I take my Dremel out of the case. 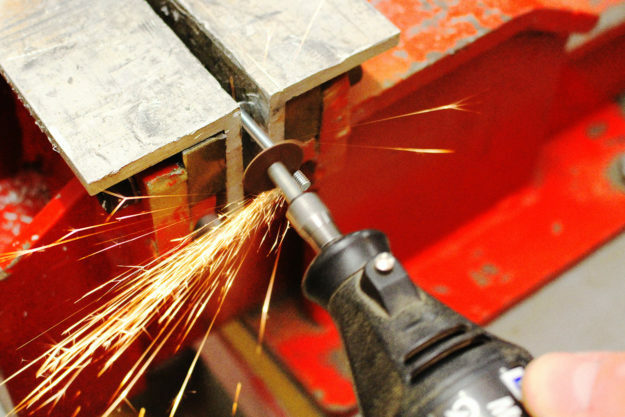 Use them for cutting small metal stock or parts. Much more finesse than an angle grinder, and a lot faster than a hacksaw. Need to cut down a steel rod? Shorten a small bolt or screw? Trim a couple of millimeters off some metal? Need to get into a tight space? Need to cut a slot in a mangled screw to fit a screwdriver? You could compare a Dremel with a cut-off wheel to an angle grinder with a cut-off wheel – just on a mini-scale, for mini-scale jobs. Like an angle grinder, the wheels need to be treated carefully. If you bend the discs significantly while they are cutting, they’ll shatter. 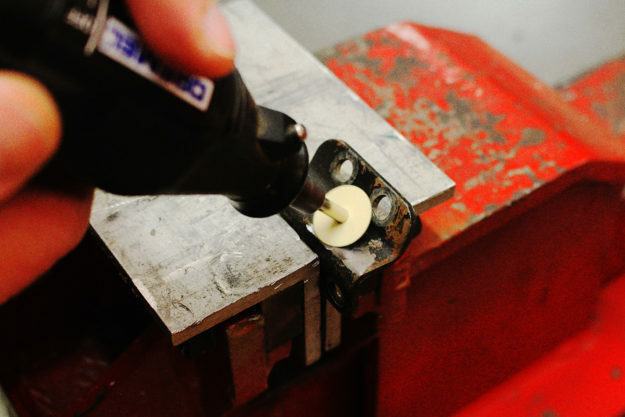 The shank that carries the replaceable cut-off wheels is also used for other accessories, such as sanding discs. Buy bulk packs of the cut-off wheels if you can find them on sale. Grinding stones or mounting points I know the article on angle grinders didn’t recommend grinding wheels due to their aggressive nature. 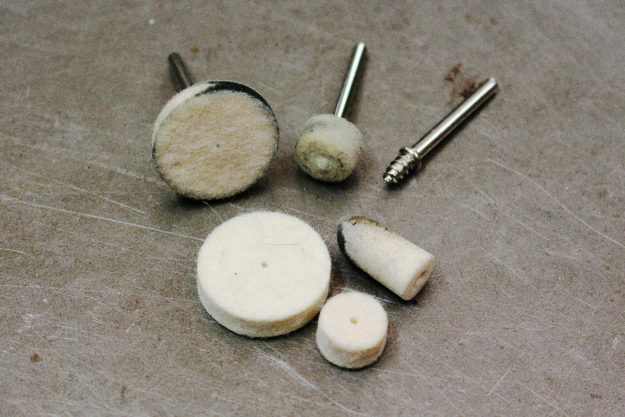 But on a micro-scale, Dremel grinding stones are really useful on motorcycle tasks—because after you’ve cut something, there is a good chance you’ll need to smooth it. The large variety of sizes simply gives you more options when you have a specific task at hand. Silicon carbide is more expensive than aluminum oxide, but if you only work with steels then you don’t really need silicon carbide. However if you use aluminum oxide on aluminum, you’ll find the stone clogs up with aluminum quickly and becomes unusable. Dressing stones The only way to address this problem is to use the dressing stone accessory. This stone essentially tears the surface grit from the mounted point and reveals a new, clean surface. To use the dressing stone, carefully bring it to the spinning mounted point and let it “grind” the mounted point. Obviously this action reduces the size of the mounted point. 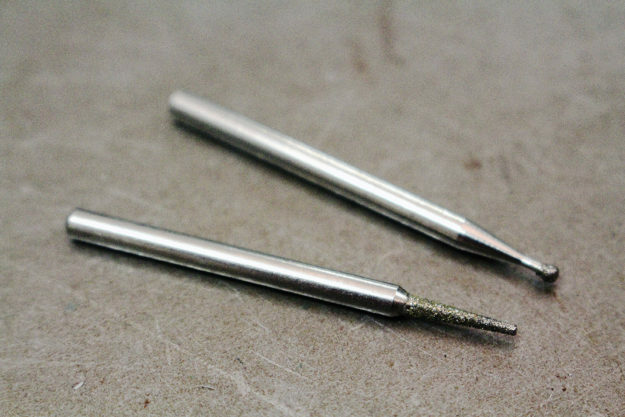 Eventually you’ll wear the mounted point down—to the point it becomes unusable and needs to be replaced. Sanding disc These tiny sanding discs are simply clamped to the cutting shank by the mounting screw. For stripping paint off inaccessible areas, to smoothing small areas, the sanding disc is a great accessory. 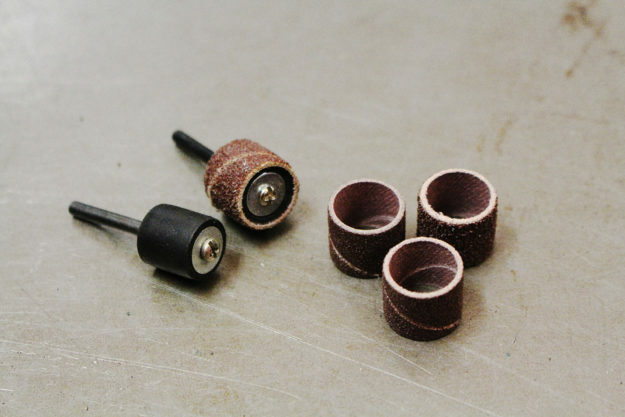 The sanding grit itself is very fine, so it’s most effective when used after other, rougher smoothing tools—such as files, flap discs on an angle grinder, or hand sanding. The discs don’t last long if you press too hard: they’ll wear the edges quickly, and eventually break off around the clamp screw. Use a light touch and let the speed of the spindle do the hard work for you. Sanding drum The sanding drum spindle consists of a rubber cylinder and a clamp screw. When you tighten the screw, the rubber cylinder is compressed and bulges out to hold the sanding drum. I’ve found these most useful when I need to slightly enlarge a hole. With very careful motion of the sanding drum inside a drilled hole, you can increase the size a little. It’s also useful for cleaning off the rough edges of a hole generated by drilling or using a hole saw. You might also use them for sharpening an edge tool, like an axe. 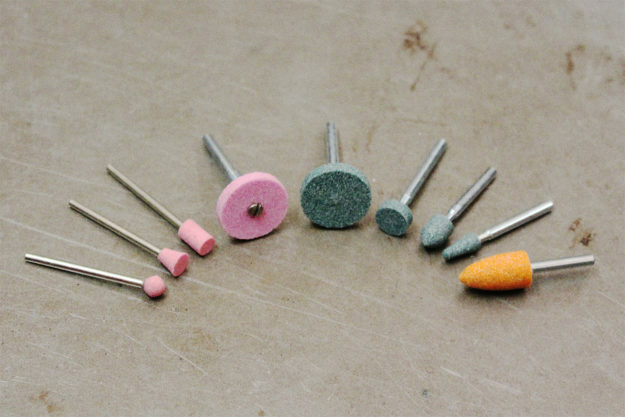 Polishing wheels Many accessory kits come with a threaded spindle and tiny polishing wheels. I haven’t found much use for these outside of polishing jewelry. You’ll need a metal polishing compound if you want to use this accessory (California Custom Purple is my favorite all-round metal polish). I’m not sure where you’d use these on a motorcycle, but let us know in the comments if you’ve had any success. Wire wheels I’ve picked up genuine and ‘no-name’ accessory wire wheels in both brass and nylon. The brass ones are useful for paint removal around irregular shapes like welds—especially if your angle grinder won’t fit in the smaller spaces on the bike. Like the sanding discs, they don’t last long with heavy-handed use. Useful, but if you rely on these to remove a lot of paint it’ll cost a fortune in replacement wheels. Cutting bits These bits are made of ‘high speed steel,’ which is a tool alloy. They cut very aggressively and are suited to softer materials like wood and plastics. While I haven’t done this, they could be used for careful freehand carving in wood, or soft metals such as aluminum. Carbide bits I bought these expensive bits for a particular job and they paid off. Strictly speaking, these bits are Tungsten Carbide. This material is very hard, strong, stiff and dense. When used in cutting tools, it withstands very high temperatures and can be used to machine through many different steels. This is where they shine. When working on a 1970s Kawasaki engine that had been in storage for years, I found the intake manifold screws (steel) were corroded into the aluminum cylinder head. When I tried to remove them, they snapped off. When I attempted to use a screw extractor, it also snapped off in the manifold screw. Many expletives were audible in my shop at this time. I needed to grind away the screw extractor, and the steel screw without damaging the cylinder head. A carbide bit in the Dremel eventually saved the engine. I used it to carefully eat away at the steel screw. I had to use a helical insert to repair the cylinder head, but it was successful. I can’t think of any other way I could have done that repair in my shop. 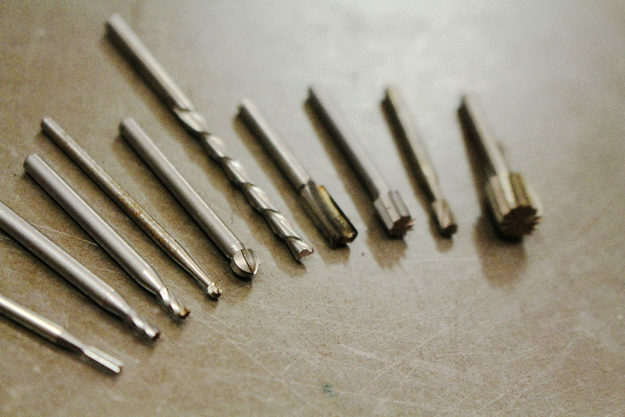 Carbide bits are not easily identifiable—compared to the many other cutting bits available—so make sure you store them carefully so they don’t get mixed up. Diamond points I’ve used diamond-coated bits to engrave very hard materials like alloy steels, stainless steel and even glass. Eventually the diamond grit is stripped from the carrying material, and they need to be replaced. 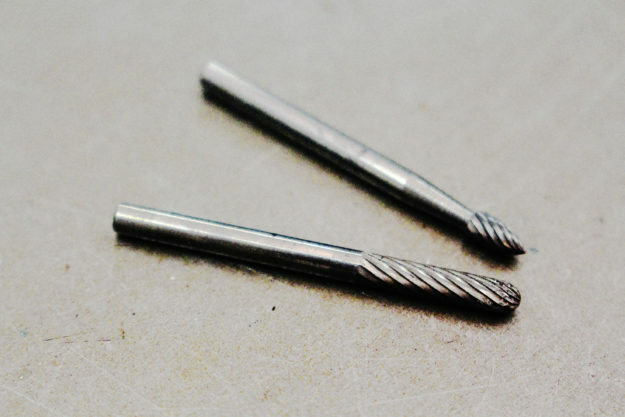 If you are grinding or engraving very hard materials, then a diamond bit might be the right tool. Dremel safety How could such a small tool cause any harm? 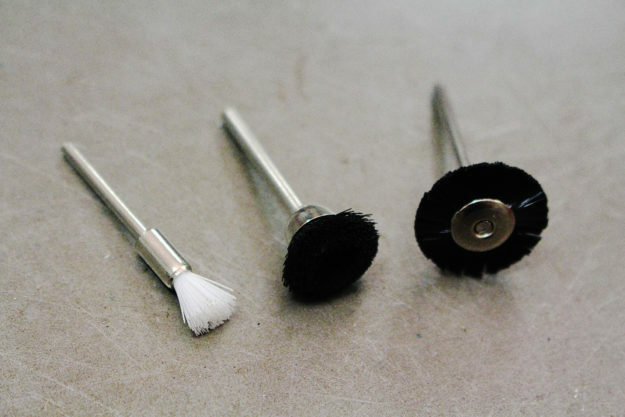 Well, they spin very fast—over 30,000 rpm—and many of the accessories will make short work of your skin. Firstly, the workpiece should be firmly secured. If it’s a small part, put it in a vice. If you have the Dremel in one hand, keep the other hand clear of the spinning tool. Secondly, consider your eyes and lungs. If the Dremel is shooting particles into the air, you should wear some glasses and even a dust mask. 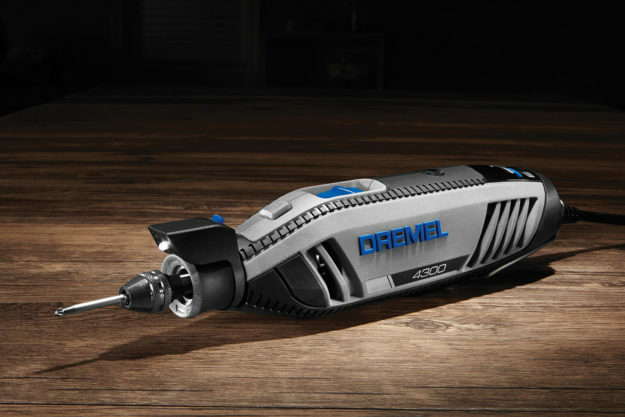 If you’re in the market for a Dremel, check out our buying guide.